A New York Times business journalist explains why it’s important for people to pursue big creative projects, and identifies both the obstacles and the productive habits that emerge on the path to completion—including her own experience writing this book. Whether it’s the Great American Novel or a groundbreaking new app, many people want to create a Big Thing, but finding the motivation to get started, let alone complete the work, can be daunting. In The Big Thing, New York Times business writer and editor Phyllis Korkki combines real-life stories, science, and insights from her own experience to illuminate the factors that drive people to complete big creative projects—and the obstacles that threaten to derail success. In the course of creating her own Big Thing—this book—Korkki explores the individual and collaborative projects of others: from memoirs, art installations, and musical works to theater productions, small businesses, and charities. She identifies the main aspects of a Big Thing, including meaningful goals, focus and effort, the difficulties posed by the demands of everyday life, and the high risk of failure and disappointment. Korkki also breaks down components of the creative process and the characteristics that define it, and offers her thoughts on avoiding procrastination, staying motivated, scheduling a routine, and overcoming self-doubt and the restrictions of a day job. 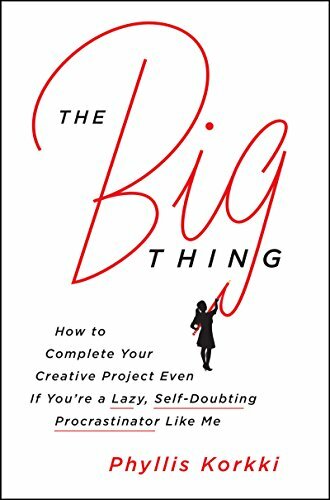 Filled with inspiring stories, practical advice, and a refreshing dose of honesty, The Big Thing doesn’t minimize the negative side of such pursuits—including the fact that big projects are hard to complete and raise difficult questions about one’s self-worth. Inspiring, wise, humorous, and good-natured, The Big Thing is a meditation on the importance of self-expression and purpose.